Quotation marks are signposts indicating that spoken or written words are being expressed. They have other purposes, too, but this post confines itself to this role. Notice, however, that I wrote “generally,” and not just because of the British English exception. (As you see here, a comma, like a period, is located inside quotation marks when it follows one or more words thus confined.) What are the exceptions? If the terminal punctuation mark is a question mark or an exclamation mark, and it appears outside the context of the quotation, it should be located outside the quotation mark as well. For example, notice the placement of the question mark in “Who said, ‘You have nothing to worry about’?” The framing sentence, not the quotation, is an interrogative sentence, so the question mark belongs outside the single quotation marks bracketing the quotation (but inside the double quotation marks, because it is part of my example.) By the same token, in the sentence “I can’t believe he had the nerve to say, ‘You have nothing to worry about’!” the indignation resides in the context of the framing sentence, not in the recitation of another person’s contentious comment. Notice also that, though a period would ordinarily be located within the quotation followed by the question mark and a comma would usually appear after “about” in the example with the exclamation point, quotation marks and exclamation points trump and replace periods and commas in such sentence constructions. Punctuation marks are never paired (except in the use of multiple question marks or exclamation points in informal writing, and in the case of a close parenthesis and a period, like the tag team you see right here). That’s not all there is to quotation marks, of course. For example, in a future post, I’ll discuss the subtleties of proper placement of attributions, those identifying phrases such as “he said” or “she added” so fundamental to both journalism and literature. I think your explanation of British usage could be clearer. In essence, we punctuate quotations in a similar way to parenthesis: punctuation goes inside the quotation marks if it is part of the actual quotation. I read somewhere that a semicolon doesn’t go inside a quotation mark. Is this true? As British I’m not sure I wholly agree with Mark’s British exception. ‘ “You have nothing to worry about.” ‘ is exactly what I would write and is what I was taught. The double or single quotation marks issue has more to do with house-style here in Britain than a national standard. However, Fowler agrees with Mark and says, ‘There is no universally accepted distinction… The more sensible practice is to regard the single as normal…’. The main thing is consistency. Beyond that, quotations and citings within either single or double quotation marks will be within the inverse. Rebecca, a semi colon isn’t a closing mark, so in AmE and BrE it goes inside the quotation marks if it is part of the quotation. You could have a sentence with a quotation, then a semi colon and then the rest of the sentence, but it would look odd and would probably be better split into two. Tony, I agree. I use double quotation marks mainly for cosmetic reasons: they are more visible and can’t be confused with apostrophes. I like to tell my English students “In the United States of America, periods and commas NEVER NEVER NEVER go inside of quotation marks.” However, there is the annoying exception of punctuating references in bibliographies. Oh, well. Hm, Shari–you and I seem to have learned from two entirely different style manuals. I live in the USA, and I was taught that commas and periods always go inside the quotation marks, colons and semi-colons always go outside. I’m rethinking that following Mark’s post, as what he says makes sense. . . Thanks Mark, much appreciated. I especially appreciate your acknowledgement of standards other than US. I agree with Tony Hearn, however; the preference for single or double quotes depends, like the suffix -ise/-ize, on house style. Oxford prefers singles but most British and Australian news media will use double. I tend to use singles in my academic material (and here, out of habit) and but switch to doubles for my employer. Again, the main thing is consistency. 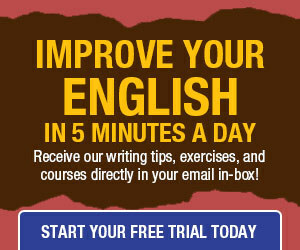 Thanks to you and other speakers and writers of English forms other than American English for clarifying various points. 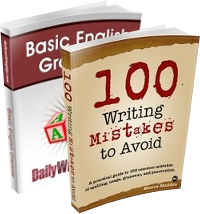 I’m new to the DailyWritingTips.com fold and didn’t realize there were so many site visitors from outside the United States. I’ll keep that in mind as I post new entries. I based my comments about use of punctuation with quotation marks in British English on my readings of older British works. (A few years ago, for example, I edited some E. Nesbit books to conform to American English. Actually, I didn’t realize that modern usage varies between the traditional British model and the American format among writers in the United Kingdom and its former colonies other than the United States. I stand corrected, and I’ll be careful to verify my assumptions. Thanks again! PDF file found corrupted, but I couldn’t find a way to download again this PDF. It says, u r already registered user, so no need to sign in for newsletter again. so how can i get it again? People keep saying this, but, as I keep pointing out, it’s not actually true. The Oxford Style Manual says it, and it seems to be common nowadays, but British books published prior to, say, the late 1970s, tended to use double quotes and put the final punctuation inside, just like modern American practice. Uh, @Faris Pallackal –what makes you think anyone is reading your posts here? If you’re having trouble with the download – contact the site authors via the “Contact” button at the bottom of the page. BTW I downloaded the file no problem – post your email address and I’ll e-mail it to you. @Kathryn is the most correct. Whatever the whole article couldn’t tell he cleared in few lines. Yes, semicolon and colon go outside, and others go inside. @Shari Weiss, sorry for your students!